Sending a case of Moet Champagne will really get any party started. 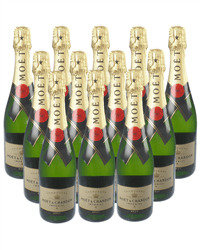 Our range of twelve bottle Moet & Chandon Champagne case deals can be a mixture of Brut, Rose, Vintage or a mixture. Whatever you choose, simply order online or by phone and we will deliver your gift carefully packaged with your personal gift message.